The Watch Roll is available in both a black and tan finish, with the latter the one we've been using. It reminds us more of a woodworkers tool belt than a normal gear bag, particularly in the tan. 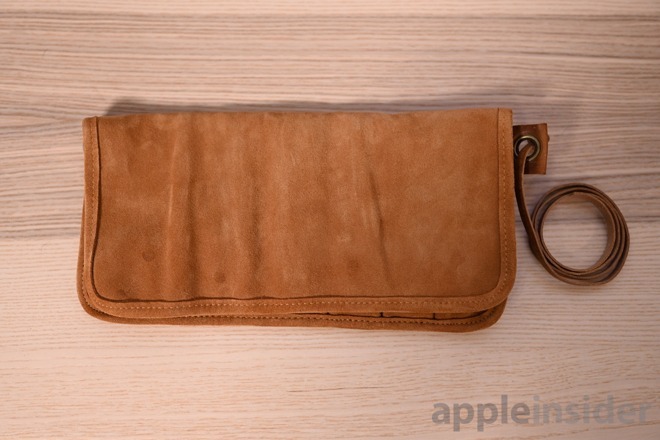 Two layers of vegetable-tanned suede are used which makes the wrap particularly hefty and solid. This thickness does make it bunch up a bit when rolled, but the added protection is entirely worth it. When unfolded, six pockets line the insider. Three of them -- those to the left -- are slightly larger than the others. 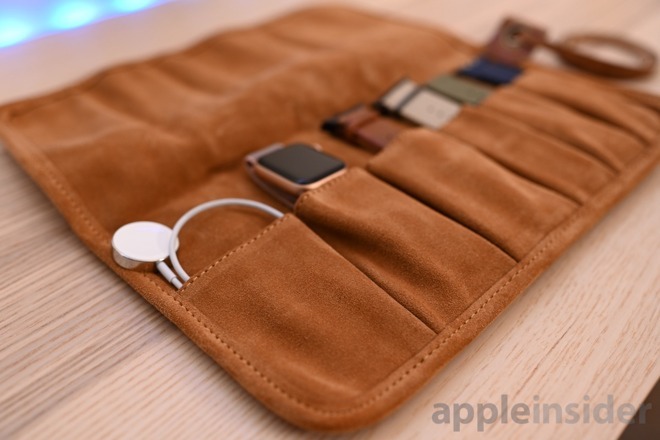 This makes them better for larger accessories such as charging cables or the watch itself. 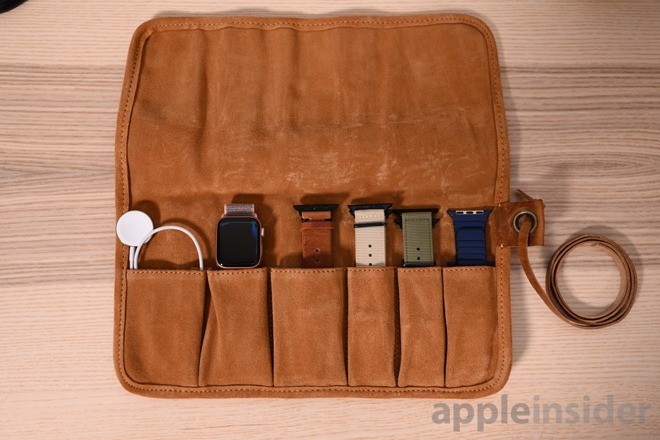 The smaller ones are the perfect size to fit Apple Watch bands, though we end up filling five of the six with them. One caveat to a roll like this, is you are limited by the bands you can store. South Straps only sells two-piece bands, but if you have a metal link band, like the Nomad titanium model, it won't easily fit. You could potentially slide it in, but it would be a bit longer than the roll when folded in half. As we have a couple of these one-piece bands in our collection, it does cause a bit of turbulence. When you add all your accessories in, the case is just rolled right up. On one end is a leather tag with a metal eyelet. Running through the eyelet is a lengthy strip of leather with a knot on the end. The knot keeps it from coming out of the hole, but a bit of fiddling could make it come through. This initially had us concerned, but after using it, we realize that it doesn't need to be overly tight at that spot. 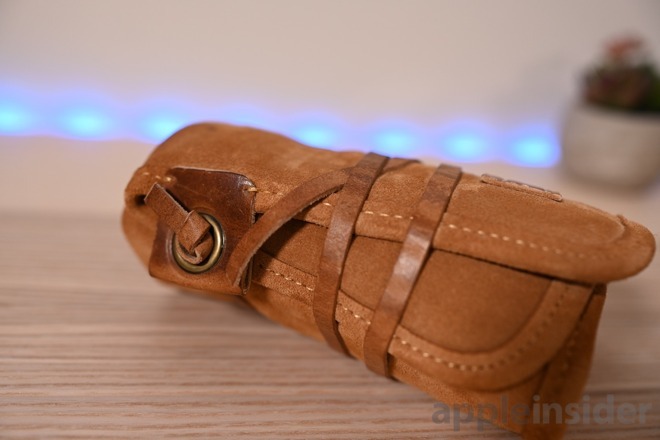 To secure the roll, the leather is wrapped around and either tucked under itself to stay in place, or tied in a simple knot with the opposite side. Both methods work, though we just wrapped and tucked the majority of the time. The simplicity of the Souther Straps watch roll is envious. It looks great, is functional, and isn't overly cluttered or made of plastic. We didn't usually travel with many of our watch bands because we didn't have a dedicated place to keep them, but with this watch roll, we can always go in style. The Southern Straps vegetable-tanned calf suede watch roll is available directly from the manufacturer for $90 in black or tan. 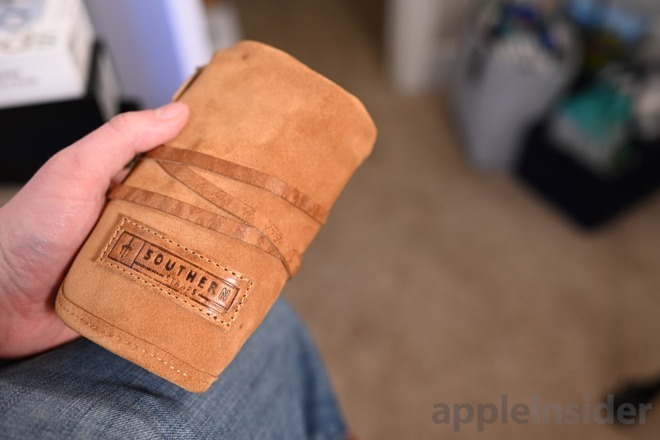 If you're looking for an Apple Watch band to go with the Southern Straps Watch Roll, there are a variety of options made by popular brands, such as Apple itself, Nomad, TwelveSouth and more. Wouldn't an owner who needs that many watch bands "to travel" have a staff of servants to manage them? This is making me feel like such a slob... So this is how nice people live and travel. I feel like there should be a set of wrenches there. When I first got my Apple Watch, I bought a lot of different colored bands. But as time went on, I've just stayed with the original Apple black band. Trying to keep life simple, I guess. I guess it's overkilled if I only have 2 set of bands. I, as a member of the riff raff and hoi polloi, have only two Watch bands: the back rubbery one it came with, which I use occasionally (mostly for exercise), and the black Milanese Loop which is my daily driver. I would be happy to buy more, but my wardrobe is "sad aging goth" in nature, so these cover my needs pretty well.